Mycetomas are endemic parasitoses in Niger (West Africa) and in other tropical countries. In the literature, the etiological forms (actinomycotic and eumycotic) are described with tumorous lesions in various localizations. In this paper, we report on a giant cephalo-cervical lesion due to a Streptomyces somaliensis actinomycete. This particular localization led during the evolution of the disease to the destruction of the patient's left eye. Ketoconazole was administered with a complete recovery of the lesions. The term mycetoma refers to disease processes where exogenous actinomycotic or eumycotic causative agents produce parasitic grains . Mycetoma is a condition long-known in India that affects the lower limbs. It was first described in 1842 by John Gill in India's Madura Madras area, hence its alternative name as "Madura foot" . Mycetoma causative agents are saprophytes that are widespread in the soil of endemic regions and on thorny shrubs of the Mimosa family in semi-arid climates . Several studies have been done throughout the world [2,4-6] and in Africa, especially in Sub-Saharan Africa [3,7-12]. 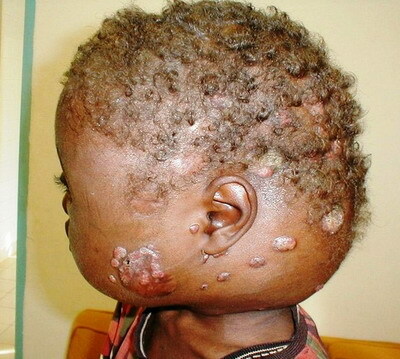 In Niger, the disease was described for the first time in 1985 . In this paper, we report on a rare case of cephalo-cervical mycetoma due to Streptomyces somaliensis. The patient, AH, is a 20 years old farmer living near the town of Tanout, in a rural area in the North-East of Niger where thorny shrubs are abundant. He was referred to the neurosurgery department of the National Hospital of Niamey (HNN) for cranial swelling and was subsequently sent to the dermatology department. The patient indeed admitted that he has been pricked, cut or bruised many times over in his life by thorns, shreds and tools, and that he always neglected the ensuing little wounds. This is a normal behavior for most farmers working daily in the fields. His illness started 8 months prior to consultation, when two bullous lesions appeared on his left cheek, releasing a yellowish liquid. Later, a swelling occurred on the cheek and spread rapidly to the whole left occipito-temporal area. An April 9, 2003 medical examination showed a left cheek edema extending to the neck, the left temporal region, the left periorbital region, and the right of the posterior auricular area. In these areas, there were several budding lesions, isolated or congregated in plaques (Figure 1). The plaques were erythematous and fistulizing in some places, letting out a purulent liquid and yellow grains. 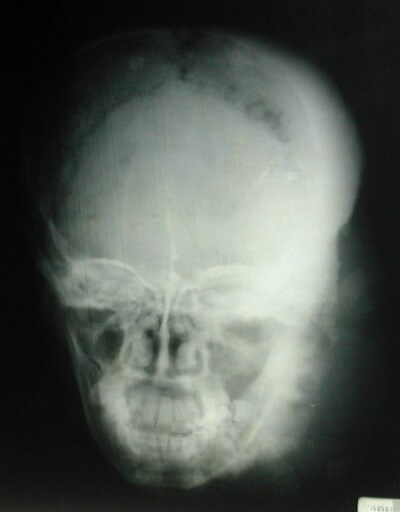 Skull Radiography showed a thinning of the left occipitoparietal vault with osteosclerosis and osteolysis areas and a widening of bone sutures (Figure 2). The osteosclerosis resulted from bone deposits that are perpendicular to the bone surface and extended from the second cervical vertebra to the sphenoid greater wing and the left mandible. The damage to the left eye was probably due to the inoculation of the causative agent in the eye after a trauma on the upper eyelid (Figure 3). However we did not carry out laboratory tests to confirm our observation. The ultrasound scan of the soft cervical tissue evidenced a dense echogenic body that is somewhat heterogeneous, with no identifiable necrotic or fluid areas, and the limits of which were difficult to ascertain. The dense tissue was in contact with the jugulo-carotid vessels of the neck. Along the branch of the mandible, there was an exophytic reaction from the dense body. Beside the eye damage referred to above and a restriction in the extent of the mouth opening (due to damage to the jaws), electromyogram and electroencephalogram tests showed no other sensory or motor abnormalities. 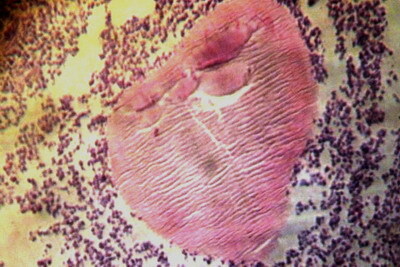 The histopathological examination of a biopsy specimen led to the etiological diagnosis involving an actinomycete: the Streptomyces somaliensis (Figure 4). The Gomori-Grocott stain allowed the elimination of mycelium filaments and false mycoses. Although mycological cultures may add more certainty in the identification of the causative agent, we considered that the histopathological tests carried out were unambiguous in this respect. On May 6, 2003 the patient started an azole treatment (Ketoconazole) with 200 mg tablets, one tablet daily. After 6 months already, the results were encouraging, with a remarkable reduction of the swelling along with a total extinction of the fistula and the disappearance of lesion buddings. Still, the left eye was bulging with a cataractal outlook. After a two-year treatment, we noticed a total remission of the lesions. However, the left eye was permanently damaged and a prosthesis was installed (Figure 5). Mycetomas are pseudo inflammatory tumors that are caused by actinomycetes, which are filamentous bacteria or fungi. The inoculation of the etiologic agents in the subcutaneous tissue is secondary to trauma of various causes (thorny wood, tools contaminated by soil, fish bones, bites from snakes or other animals, sports accidents, traffic accidents) [3,14]. The typical location of mycetomas is the foot, hence the historical name of "Madura foot". While multifocal localizations are rare [3,15], the cephalocervical location is exceptional [10,13,16,17]. We have noticed that the patient had multiple wounds on the scalp and the left eyelid sustained from passing under thorny tree branches. We believe that these scalp and eyelid traumas lead to an infection of the cephalocervical area. The onset of mycetomas is generally characterized by a nodule that evolves gradually and slowly leads to the classical picture of a multifistulous tumor. 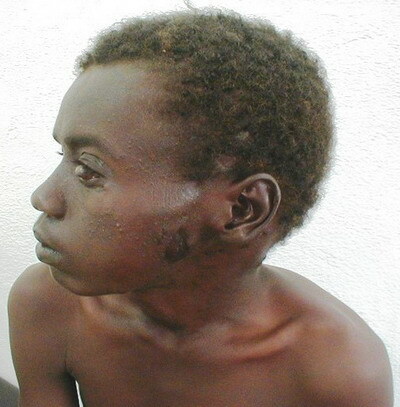 In the case of our patient, the condition was characterized by bullous lesions on the left cheek. Due to the often painless nature of mycetomas, patients take several months or years before seeking care [9,10,13]. Our patient has been first examined 8 months after the onset of the disease. Streptomyces somaliensis was evidenced in our patient, after using Gomori Grocott stain . This actinomycete has more osteophilic effects than eumycotic agents [8,19]. For mycetomas due to Streptomyces somaliensis, some authors recommend a streptomycin cotrimoxazole combination . However, because of the side-effects of Sulfamethoxazole /trimethoprim that we observed during our practice (among others, the Toxic Epidermal Necrolysis), we decided instead to exclusively use Ketoconazole. The treatment, at a dose of 200 mg per day, lasted for two years. The outcome was very positive with a complete recovery. No clinical of biological side-effects were observed. Mycetomas caused by Streptomyces somaliensis are sensitive to Ketoconazole, but the treatment takes a long time. 1. Univers Centro Occidental " l'Alvarado ". Mem 1er Symp Int Mycetomas Barquisimento, 1978. 2. Hoenner F. Les mycétomes: à propos d'un mycétome à grains blancs vu à Paris. Thesis, 1984; N°00593. 3. Develoux M., Dieng MT., Ndiaye B. Mycétomes. Encycl. méd. chir. Maladies infectieuses, 8-066-A-10, 2002, 11p. 4. Brendl BJ., Mac Key D., Al Saati F., Sheth KV., Ofole SN., Bailey TM. Mycetoma in Saudi Arabia. J Trop Med Hyg, 1987, 90:51-57. 5. Buot G., Lavalle P., Mariat F., Suchil P. Etude épidémiologique des mycétomes au Mexique, à propos de 502 cas. Bull. Soc Path Exot, 1987, 80:329-339. 6. Fletcher CL., Moore MK., Hay RJ. Eumycetoma due to Madurella mycetomatis acquired in Jamaica. British journal of Dermatology, 2001, 145:1018-1021. 7. Develoux M., Ndiaye B., Dieng MT. Les mycétomes en Afrique. Cahiers de santé, 1995, 5:211-217. 8. M. Develoux , M.T. Dieng, A. Kane, B. Ndiaye. Prise en charge des mycétomes en Afrique de l'Ouest. Bull. Soc Path Exot, 2003, 96 (5): 376-382. 9. Ndiaye B., Develoux M, Dieng MT, Kane A., Ndir O., Rapheron G., et al. Aspects actuels des mycétomes au Sénégal: A propos de 109 cas. J Mycol Méd, 2000, 10:140-144. 10. Philippon M., Larroque D., Ravisse P. Mycétomes en Mauritanie: Espèces rencontrées, caractères épidémiologiques et répartition dans le pays à propos de 122 cas. Bull. Soc Path Exot, 1992, 85: 107-114. 11. Mahe A., Develoux M., Lienardt C., Keita S., Bobin P. Mycetoma in Mali: causative agents and geographic distribution. Am J Trop Med Hyg, 1996, 54: 77-79. 12. Ndiaye B., Develoux M., Dieng MT., Ndiaye PD., N'dir O. Les mycétomes à la clinique dermatologique de Dakar (Sénégal): aspects épidémiologiques à propos de 111 cas. Médecine d'Afrique Noire, 1995, 42:207-211. 13. Develoux M., Vetter JM., Audouin J., Treguer J. 63 cases of mycetoma Niger Republic (etiological study based Histopathology). Bull. Soc Path Exot, 1985, 78:574-584. 14. Fahal AH. Mycetoma: A thorn in the flesh. Trans of the Roy Soc Trop Med Hyg, 2004, 98: 3-11. 15. Rey M. Les mycétomes dans l'ouest africain. Paris: Editions Foulon; 1961. 16. Develoux M., Ndiaye B., Kane A, Diourne P., Huerre M. Les mycétomes du cuir chevelu et de la nuque à Dakar. J Mycol Med, 1999, 9: 63-67. 17. Nozais JP., Canel MA., Datry A., Darris M. Mycétome du cou et de la nuque à Madurella mycetomatis, à propos d'un cas mauritanien. Bull. Soc Path Exot, 1963, 56:161-173. 18. Destombes P. Histopathologie des mycoses et des fausses mycoses. Arch. Inst. Pasteur, Algérie, 1968, 46, 5-36. 19. Develoux M., Dieng MT., Ndiaye B. Les mycétomes. J Mycol Med, 1999, 9:197-290.